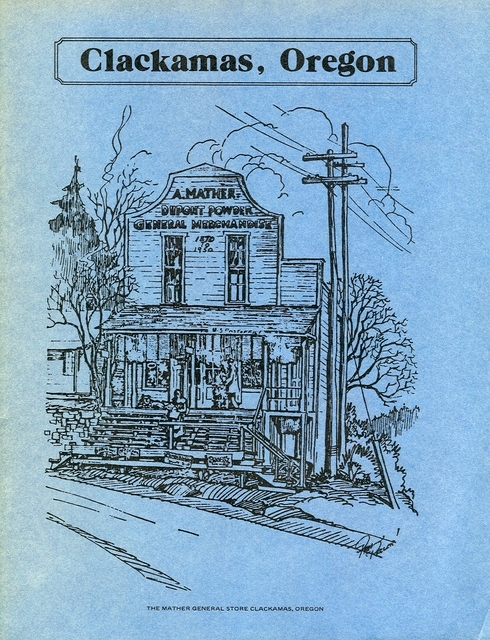 Front Cover and Dedication Page for the "History of Clackamas, Oregon"
Illustration: "A. Mather DuPont Powder General Merchandise 1870 to 1950"
"In 1877 the first fish hatchery in Oregon was built on the Clackamas River one mile below Carver. It was built by the Oregon and Washington Fish Propagating Company and operated for four years. Personnel of the U.S. Commission of Fish and Fisheries took the fall chinook salmon eggs and as soon as the fry were hatched, they released them back into the river. This operation was discontinued in 1880. By 1887, the Oregon State Board of Fish Commissioners was created. Leasing the abandoned hatchery at Carver, they reopened it with state funds. The Federal Government came to its aid to supply funds the next year, but a dam across the river at Gladstone prevented the salmon from coming up in the fall. The egg-taking operations ceased at Clackamas in 1894 until passage could be provided over the Gladstone dam. Finally, in 1895, the Columbia River Packers Propagating Company put a ladder over the dam. In the report of the Commission for June 1901, E.N. Carter, supervisor at Clackamas Hatchery decided that because of insufficient water, the hatchery would be moved further down the river to take advantage of the large spring off the beaver lake area. The equipment was moved from the old site to the present one just south of the town of Clackamas. A hatchery building 42’ x 42’ was built and it can be seen today. There was a bunkhouse 30’ x 42’ and a large stable. The Clackamas Fish Hatchery operated continuously until 1942, when it was closed down. In 1955, the United States Fish and Wildlife Service deeded the property to the Oregon Fish Commission for a research laboratory. Several early pioneers in Clackamas were active at the hatchery. Mr. Mitchell was director as well as King Spurgeon. Mr. and Mrs. Hawley lived in the large home on the grounds. Many early picnics and parties were held in this beautiful spot." Today the occupant of the hatchery complex is the northwest regional office of the Oregon Dept. of Fish & Wildlife. 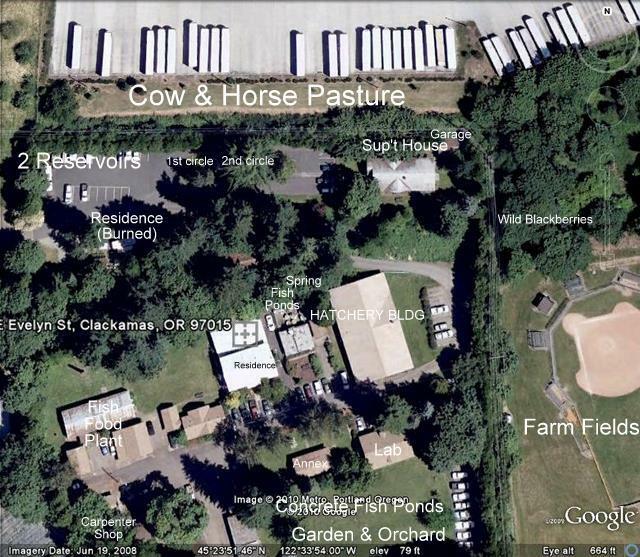 Their records show that the land where the hatchery complex is sited was originally part of the Donation Land Claim of Isom and Matilda Cranfield, called "Clackamas Riverside." On Dec. 17, 1910 the property was purchased by the Federal Government from the Deadman family. 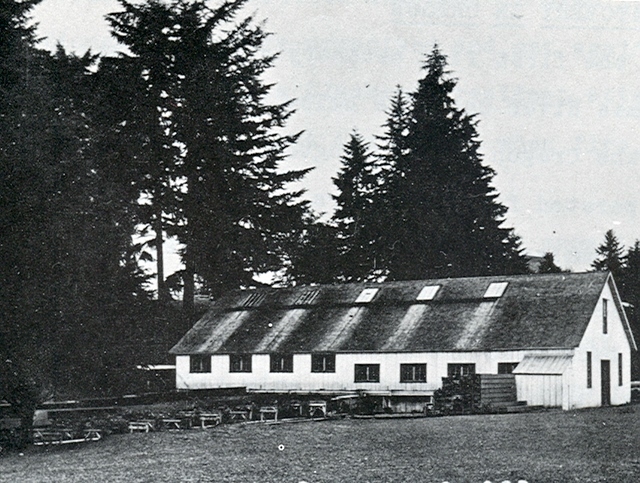 In 1911 the Clackamas Fish Hatchery was built on the site. 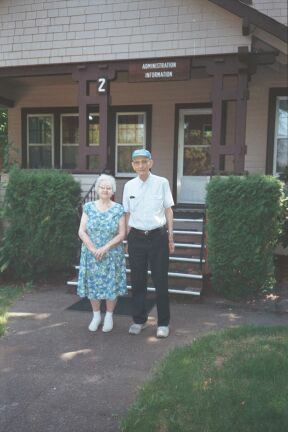 I lived at the Clackamas Fish Hatchery from the summer of 1940 until my marriage in December, 1950. At that time, Clackamas was a little village of perhaps 500 souls, located about 20 miles southeast of Portland. One "Red and White" grocery store, a more modern version of the Mather DuPont powder store pictured above (dynamite was an integral ingredient in logging, apparently), one Congregational church, a U.S. Post Office located right next to the Southern Pacific railroad tracks, and the Clackamas Grade School made up the village. The fish hatchery was about a mile south of Clackamas and had been owned and operated by the Federal Government since 1911. Thanks to that early date, the entire hatchery grounds and its buildings are now listed on the Historic Register. 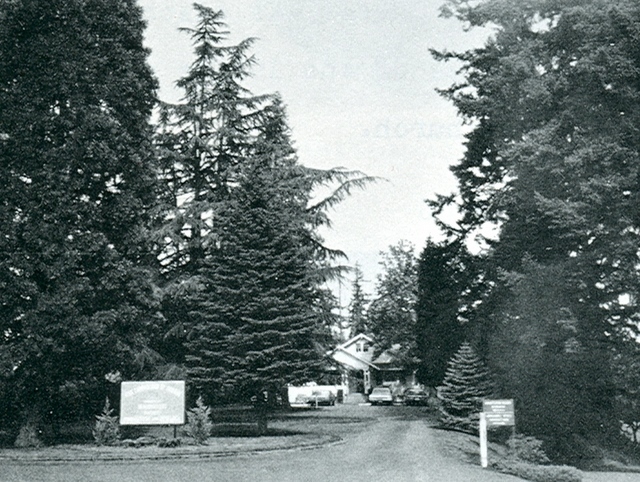 By 1940, the hatchery was operating on a very limited basis, and the three residences on the grounds were no longer occupied by hatchery employees. My father, Alphonse Kemmerich, a career employee of the US Fish and Wildlife Service, had been at the Bureau of Fisheries office in Seattle, Washington. In 1940, Congress granted President Franklin Roosevelt the authority to reorganize the agencies of the U.S. Government. As a result, they consolidated the former Bureau of Fisheries and the Bureau of Biological Survey into the Fish and Wildlife Service and the regional office for the combined agency was established at Portland, Oregon in place of the existing offices which had been at Seattle and Denver. My father was among those relocated to the Portland area. Our family of four were: my father, Alphonse, my mother, Pauline, my younger brother and only sibling, Noel, and myself. At the time we moved to Clackamas I was 9 years old, and Noel was 3. The new Portland Regional Manager was Fred Foster. He was offered the Superintendent’s house at the Clackamas hatchery, and he encouraged my father to apply for housing there also. We moved into the smaller house located near the entrance to the hatchery property (which has since burned). What a deal! Even in 1940, monthly rent of approximately twenty dollars for a three-bedroom, one-bath home was a bargain. My father and Mr. Foster car-pooled and commuted to the regional office in Portland every day. About 1942 Mr. Foster retired and moved back to Seattle. 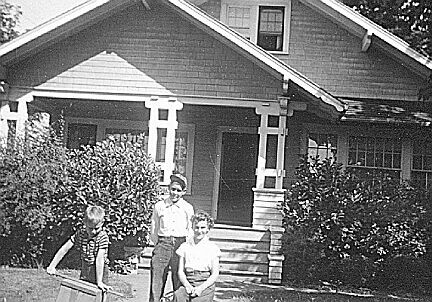 To my delight, we then moved into the much-superior Superintendent’s house and remained there until 1950 when my parents bought a home on Lake Road, in Milwaukie and I married and moved out of state. The reason for the decline of the fish hatchery was the loss of necessary spring water. According to my father, the source of the springs that provided ideal water temperature and ample flow for raising salmon was severely impacted by the development that took place on the gravelly valley a few miles north of the hatchery. Apparently the entire valley had originally been a wetland. (In Clackamas, Oregon, Vol. 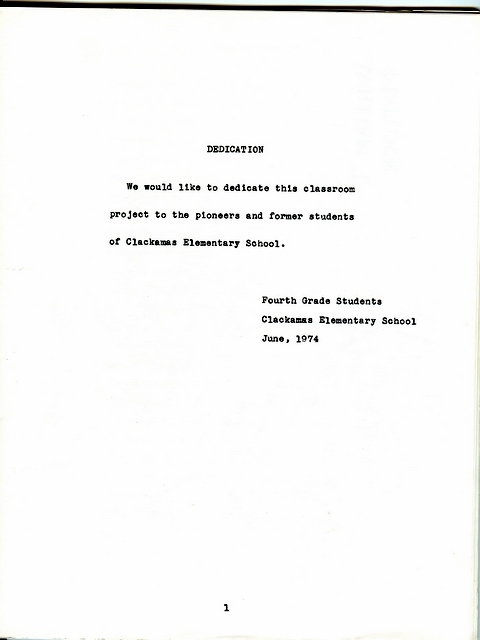 1, a history of Clackamas written by Clackamas Elementary School students in 1974, the article on the hatchery refers to "a large spring off the beaver lake area.") My father thought that the construction of the National Guard’s Camp Withycombe on top of the springs’ source was the major cause for the reduced water flow and warmer water temperature of the hatchery springs. I do remember that they were still raising some fish at the hatchery in those early 1940’s. Probably brought from hatcheries upstream on the Clackamas River: there was a small hatchery and egg-taking station at the small hamlet of Eagle Creek, at the junction of Highways 224 and 211 and another, larger, hatchery near Eagle Fern Park (I believe this is now the site of a new federal fish hatchery). There were two levels at the hatchery property: the upper level was on an old river bluff and consisted of two houses for hatchery staff plus two huge, deep concrete reservoirs, directly across from the house near the entrance. Apparently the reservoirs were originally used for storage of water for the hatchery. They had ceased to function by the time my family occupied the house across from them. Over the years, my brother and I found new uses for the reservoirs: they made a fairly good roller skating rink, a small tennis court (with sloping sides!!) and on the Fourth of July, small "ladyfinger" firecrackers could be lit, and tossed in the big open standpipes next to the reservoirs--which resulted in a much magnified and very satisfying BOOM!! The "business" portion of the hatchery was all located below the bluff, on river-bottom land. A one-lane, gravel road led down to the lower level. Dominating the scene was the huge hatchery building itself. I remember it as always dimly lit, and the burbling sound of running water could be heard, as it flowed through the fish-rearing troughs. The troughs themselves were constructed of thick, redwood boards, heavily coated with a black waterproofing substance. 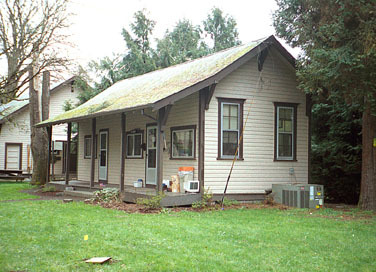 The "Annex" Building, believed to be the oldest building on the Clackamas complex. There was a laboratory across the road from the main hatchery building and it was always in use, even after the hatchery itself ceased to function. There were other smaller buildings down near the hatchery building--a fish food plant where (ugh!) tripe, dead fish, seals and other food sources deemed tasty by both large and small fish were processed. There was a refrigerated room to hold the fish food. A third residence was west of the hatchery building. Among its occupants while I lived at the hatchery were: Hanford and Lois Thayer. Lois was the daughter of Fred Foster, and her husband worked in the Regional Fish & Wildlife Office in Portland. Later, the Cheney family lived there. Mr. Cheney was a "Predator Control Officer." While based at the Regional Office in Portland, I think he spent a lot of his time in rural Oregon--mostly killing coyotes. The last family to live there were Paul and Muriel Zimmer and their two daughters. Paul also worked in the Regional Office. He and my father carpooled to their Portland office. The carpenter’s shop was full of interesting tools--my father would occasionally use the shop and tools for some home repair project. My brother, Noel, and I loved to tag along and inspect the planes, drills, miters and other woodworking equipment. Garages for hatchery trucks and a gas tank for storage of fuel for the trucks were at the west end of the lower property, beyond the carpenter shop. In its heyday, the Clackamas hatchery must have been almost self-sufficient. There was a large orchard just south of the laboratory building with a variety of fruit trees--I particularly remember the delicious plums that were a mouth-watering treat for hungry children returning from an August swim in the chilly Clackamas River. Apples of many varieties grew there too. There was a large garden area near the orchard and all the residents made good use of this to grow their own produce during the years of World War II and "Victory Gardens." In addition to the hatchery building, there were outdoor fish-rearing ponds at various points on the lower level. By 1940, only two ponds were still in use. They were located just under the bluff, adjoining the hatchery building. These two ponds were unlike the dry, unused round, cement rearing ponds south of the Annex building. The two small ponds were obviously designed to be part of the garden landscaping, and had attractive rock-lined borders. These two remaining ponds housed some enormous, ancient Columbia River sturgeon and one needle-nosed fish--whose appearance made me think he should be in tropical waters. The needle-nosed fish soon disappeared, but the sturgeon were there until at least the late forties when I believe they were moved to the Bonneville Dam grounds. The sharp spines running down a sturgeon’s back are very intimidating--my brother and I gave those fish a wide berth. But, in actuality, they were very docile and were the "pets" of the hatchery. They attracted a lot of attention from visitors and were lovingly tended by the few people still working at the hatchery. The number of men actually working at the hatchery dwindled with the onset of World War II and the official closure of the hatchery in 1942. Certainly, there were some fish culturists and groundskeepers still there until the closure. But the bulk of those working at the hatchery after 1942 were research scientists utilizing some empty buildings for their laboratories. What they were studying--I have no idea. But they were a pleasant bunch--and probably very grateful for such a peaceful workplace. My brother was about three years old when we moved to the hatchery and his heroes were the young men doing the lawnmowing and groundskeeping. He would tag after them as they went about their work. For many reasons, we were all sorry to see those fellows leave, probably going into uniform and serving in the war. With their departure, the responsibility for maintaining the handsome landscaping around the Superintendent’s house fell to my family. No longer could my mother just point to where she wanted the primroses planted and voila! it would be done. No one else would be raking up the sharp needles from under those stickery deodara trees that graced the two "circles" in front of our home. No one else would be pruning the fast-growing shrubbery around the house. Most ominous of all--no one else would be mowing what seemed like an acre of lawn around the house! They did supply my dad with one of the earliest power lawn mowers--but the mower turned out to be no match for the gravel that was constantly being excavated by the tribe of moles inhabiting our lawn. Dad would march out, rev up the mower, make a few successful passes back and forth over the lawn, then a "ping!!" would ring out, the motor would stop, and my dad would come stomping and cursing into the house, announcing that the mower blade had hit a rock and was broken--once again. This meant the mower went to Portland for repairs that usually took weeks. Meanwhile, out came the old handmowers and my father would announce, "Well, Barbs and Noel, I guess you are going to have to mow the lawn for awhile." Oh yes, those groundskeepers were sorely missed! The entrance to the hatchery property was from 82nd Avenue. I believe the two cement pillars still stand at each side of that gravel road where it joins 82nd Avenue. A large sign hung between the pillars, announcing that this was the entrance to the ‘CLACKAMAS FISH HATCHERY." My brother, now deceased, said his earliest recollection was watching the sign being taken down, so that our moving van could drive on in to the hatchery. The Federal Government owned the road from 82nd Avenue to the hatchery grounds and once a year, it was closed to non-hatchery auto traffic to maintain ownership. For the other 364 days, it also provided access to a few other landowners before it reached the hatchery. And, walking home from Clackamas Grade School, or in later years, after the Milwaukie High School bus dropped me off at the entrance, I would pass those farms and the various hazards along the way. The road dropped down a small hill, curved left and crossed a rickety wooden bridge. There I encountered the first hazard--a pasture full of snorting, pawing Jersey bulls. Next came the railroad tracks of the main Southern Pacific line. No fancy crossing barricades here--just those white warning signs, stating "railroad crossing ahead." After looking both ways (and maybe taking a few minutes to practice on the 1940’s version of a balance beam--the track rails) I would walk on by the entrance to the Notz farm. Those were Mr. Notz’ bulls I had just passed. The Notz family had property on top of, and below the river bluff. The family’s home, that bull pasture and a barn occupied the bluff top. Down below, Mr. Notz’ main crop was rhubarb. There were four Notz children and they were major players in working the farm and harvesting their father’s crops. One daughter, Emma, was in my class in high school and was a close playmate in earlier years. Two other Notz children bracketed the 6-year span between Noel and me, and we often teamed up with these three for play sessions and chilly summer swims in the Clackamas River. After passing the Notz farm, the road swung east, past Fred Luneberg’s farm. The Lunebergs owned land on both sides of the road as well as some of that rich river bottom land below. Mr. Luneberg had served in Europe during World War I, and was one of the many to be "gassed" during a battle. This apparently caused great harm to his lungs, but in spite of his problems, he was an energetic and prosperous farmer. Much of his prosperity stemmed from his investment in long, low sheds that housed rhubarb plants. By growing the rhubarb indoors, Mr. Luneberg could get his crop on a train, and into New York City way ahead of other Willamette Valley farmers like Mr. Notz. My family was impressed with the value of hothouse rhubarb when Mr. Luneberg commented one day to my father, "Well, I just sent a freight car load of rhubarb to New York City--and bought that new Chevy with the proceeds." The Superintendent’s house was a very comfortable home for our family. It had a rather modern convenience for the time--a forced-air furnace. Originally designed to use coal, my father had it converted to burn "mill ends" wood--of which there apparently was a cheap and plentiful supply. It still had to be "stoked" but I don’t recall doing this chore--maybe one stoking a day by my father was sufficient. The living room had a very handy feature for children--there were sliding doors that closed off the living room from the front hall. This made the hallway a natural "stage" for us to present our home-grown dramatic productions. When the performance was to begin, the sliding doors could be opened and the "stage" revealed. An upright piano graced the living room and I had weekly piano lessons on it. At that time, piano teachers were quite happy to drive to their pupils’ homes every week. The bay window in the dining room was a pleasant place to soak up some sun on the infrequent winter days when it appeared. There was a low divider between the living and dining rooms. The kitchen had room for a small table on the south wall. The kitchen was the hub of activity in late summer when "canning" season arrived. My parents would drive to Salem to get fruit from relatives’ orchards. Other produce came from field or farm to the kitchen counter, and if necessary, went in two huge pressure cookers. With no air-conditioning, it could be very hot and steamy in that kitchen in late summer! Green beans, corn, cherries, peaches, pears, sauerkraut, salmon--my mother filled literally hundreds of glass jars every summer and stored them on shelves in the basement--in a small room just off the larger furnace room. The basement served another purpose--it was the locale for the washer and "dryer." But they weren’t quite the same appliances that we take for granted today. My mother had a wringer washer and two large laundry tubs in the basement and there were clothes lines strung all across the furnace room. With the wet Oregon climate, she probably hung her clothes down there at least as often as on the outside clothes lines at the back of the yard. A lot of VIP’s from Washington, D.C. and other parts of the region accepted my father’s invitation to come out to the hatchery for dinner, my mother’s famous chocolate cake--and the chance to play with Noel’s Lionel train. The after-dinner routine was that my brother would dutifully ask the guest, "would you like to come upstairs and see my train set?" When the guest agreed, Noel, my father and the VIP would climb the stairs, enter the playroom at the east end, and start the train with its transformer. Downstairs, the sound of the little train rumbling around its track could be heard. Before long, Noel would appear downstairs again--while the grown men stayed upstairs, happily kneeling on the floor and playing with the train! Most of the early years at Clackamas were war years, with the accompanying gas rationing, food rationing and other homefront hardships. We took no driving vacations, never went to the Oregon Coast or to the mountains. But the bus on 82nd Street (Paralleling I-205 today) ran from downtown Portland to Oregon City a few times a day. On Saturdays, Noel and I would take the bus to Oregon City, go up the elevator to the movie theater and enjoy the latest Hopalong Cassidy movie matinee. I had a bicycle and made good use of it, visiting friends in "downtown" Clackamas, even venturing as far as the Oaks Amusement Park one time. Summertime meant berry-picking--there were strawberry fields all around Clackamas and no one thought it wrong that children under the age of 15 should be allowed to labor in the fields. The bluff below our house had a good stand of native wild blackberries. My mother would send us out with clean, empty "Crisco" buckets with bails, and we were expected to forage for those little tart, black berries so she could turn them into pie or jam. Even child laborers worked only part of the day--in the mornings when the fruit would be freshest. That left us summer afternoons for our own amusements. My parents had a lawn swing with awning on the wide front porch of the Superintendent’s house--a perfect place for reading the latest "Nancy Drew" mystery book. And when the weather finally warmed up in mid-July and August, a group of us would walk down the dirt road between the hatchery orchard and farm fields to the Clackamas River for a swim. There was no official "beach" but there was access to the water and a small sandy point for thawing out in the sun. The Clackamas River must be one of the chilliest streams in western Oregon! But that never deterred us. As we got older and more daring, we’d sometimes catch a log or piece of lumber that came floating down, and use it to paddle across to the far bank. In one of the last conversations I had with my brother, who passed away in 1998, we talked about growing up at the hatchery. We both agreed that we couldn’t have had a better childhood. I’m grateful that so much of the Clackamas Hatchery has been preserved and even more grateful for all the good memories of it that I now treasure. In August, 1994, my brother, Noel, and I accompanied our parents back to the Clackamas Hatchery. The current owners of the hatchery, the Oregon Department of Fish and Wildlife, gave us a tour and my parents thoroughly enjoyed the chance to re-live some of their experiences while at the hatchery during the 1940's. My father always had a running battle with the moles who loved to dig in the gravel underneath the lawn surrounding our house. On this return visit, we were all amused to see that the descendants of those pesky creatures were still making a mess out of that same lawn! [Note] In May, 1944 my father borrowed a 16mm movie camera and made a short film outside our home at the Clackamas fish hatchery. Unless you have a fast Internet connection, the best way to view the movie is to right-click on Clackamas 1944 and then select the "save target as" option and save it to your computer. Once the movie has downloaded, you can open it from your computer. 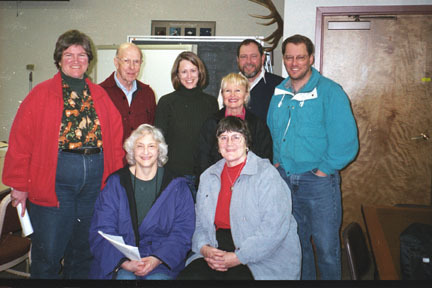 I made a later tour of the hatchery in March, 2002, at the invitation of Anne Pressentin Young, who was the Public Information Officer for the Oregon Department of Fish and Wildlife. I had noticed the name "Anne Pressentin" on news releases from ODFW in our local paper and had contacted her several months prior to see if she might be a distant relation of mine. Almost everyone in the USA with the surname "Pressentin" is related to the single family that emigrated from Germany in the 1860's. Sure enough, we share a several-times-great grandfather, Bernhard von Pressentin. In conversation with Anne, I told her that my family had lived at the Clackamas hatchery complex. She said she hoped to publish an article on the history of the complex in the ODFW newsletter and asked if I would tour the hatchery grounds and provide some historical background. I was delighted to pay a return visit to the scenes of my childhood. This time, my deceased brother's widow, Betty Kemmerich, and my husband and daughter, Glenn and Karen Halliday, were part of the tour group. John Hodges, a retired Fish Commission research biologist, who worked at the Clackamas laboratory in the early 1950's also joined the tour. Anne Pressentin, Steve King (Salmon Fisheries Manager in the ODFW Fish Division), Gloria Bourne, Clackamas Complex librarian, and other ODFW personnel listened to John Hodges and me, as we regaled them with anecdotes from the past history of the hatchery. 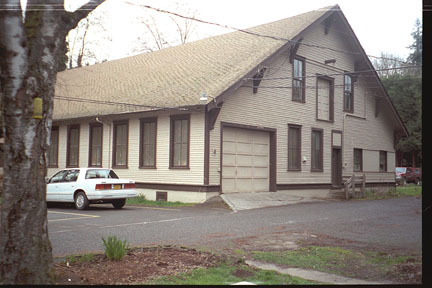 The entire hatchery complex is on the Historical Register of Clackamas County and this made it easy for me to recognize the buildings--at least the exteriors, which cannot be changed. However, it felt strange to walk into my old bedroom (upstairs, on the west end) and see it furnished as an office, complete with computer and monitor on the desk! The Superintendent's house is now the Administration building for the complex and the former living room is the reception area for visitors. Still, it was easy to look beyond the office equipment and altered room partitions and see the kitchen where my mother kept those canners going on the hot stove, or see the playroom where my brother's Lionel train once chugged around its track.